Klara Rossouw, Corey Davis, Maitland Jones, Sebastian Scherf, and Tim Jenkinson in the Coed Team Sprint. Lacey Douglas had just pulled off after completing the first lap. Last week the Mars Hill College cycling team competed at USA Cycling’s collegiate track nationals. 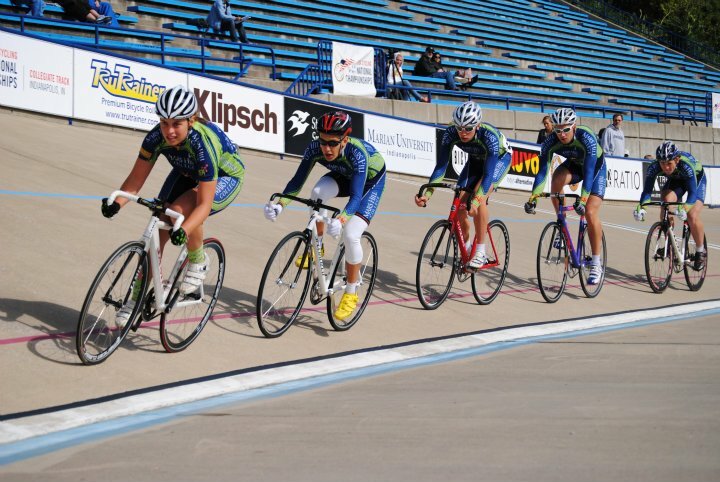 The team sent an eight person roster to compete at the Major Taylor Velodrome in Indianapolis. The men performed well in the 4k individual pursuit and kilometer time trial despite the lack of aero equipment or prior race experience on the track. Tim Jenkinson and Sebastian Scherf faced tough wind conditions during the flying 200 meter but still put up respectable times. In the Co Ed team sprint Mars Hill performed well despite a less than stellar start. The men’s team pursuit squad was happy with their performances the next day as they were not far off podium pace despite lack of equipment and practice. Sebastian Scherf qualified for the points race finals and finished the race against stiff competition. Klara Rossouw and Lacey Douglas finished well in the 3k individual pursuit, flying 200 and 500m time trial, their first time in each events. The Southeast had a strong showing at this year’s track nationals with a podium finish for Lees-McRae in D1 and Cumberland University in D2. For it being the team’s first time racing on track we are already looking forward to next year. With another year of track experience we plan on improving on this year’s sixth place finish to a spot on the podium. We would also like to thank and congratulate Marian University for hosting this year’s race and winning the team omnium again. We also want to thank the Asheville cycling community for letting us use their bikes and equipment. 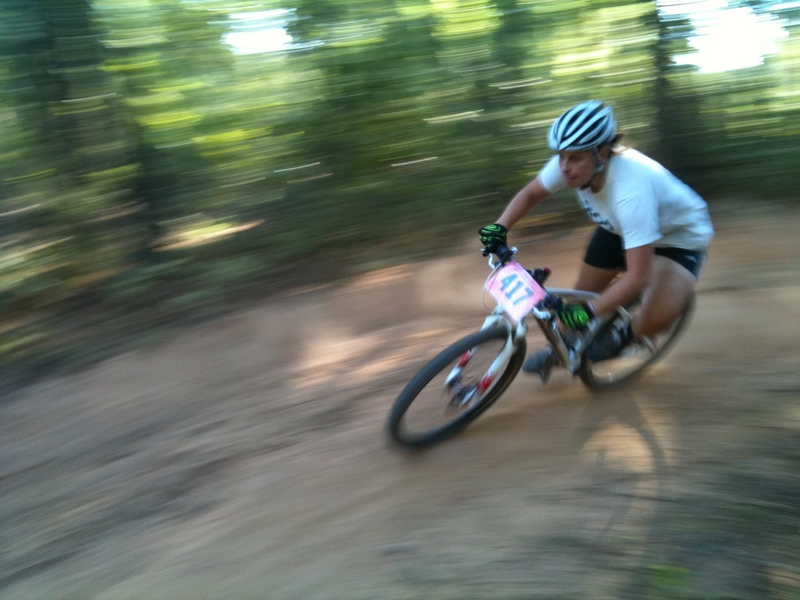 Maitland Jones takes the lead in Saturday's short track event. 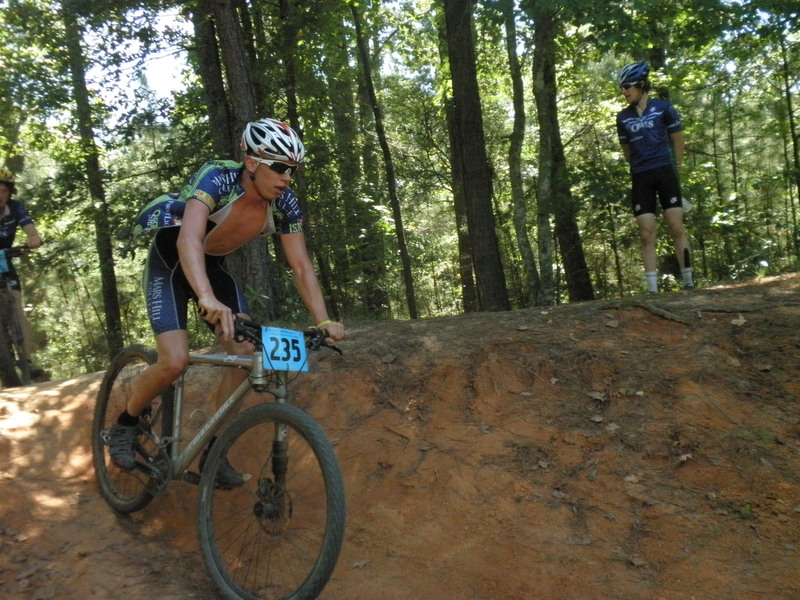 Mars Hill Cycling raced to strong results at Georgia Tech mountain bike races over the weekend, including short track and dual slalom events on Saturday and a cross country event on Sunday. Centrally located in the Southeastern Conference, the Georgia Tech races drew riders from across the conference for a well-attended and competitive weekend of racing. Both days were held outside of Conyers, GA, at the Georgia International Horse Park, which hosted events for the 1996 Atlanta Olympics in equestrian, modern pentathlon, and mountain biking. The short track was held on a figure eight style course that included a flat, grassy starting stretch that narrowed to wooded single track before looping back around on hard-packed grass. The B men’s short track gave Mars Hill its first victory of the season. Maitland Jones infiltrated the lead group and demonstrated that he was the strongest by fending off a last lap attack and coming across the line unchallenged. Jones will now move up to the A category. Mars Hill’s Chad Capobianco rode to a strong 10th after starting last and fighting his way through the field the entire race. Mikey Keith, Tim Jenkinson, and Corey Davis represented Mars Hill in the men’s A race. Jenkinson got the best start, and after a big effort, made his way into the leading group of four. Keith soon bridged up to give Mars Hill two riders in the lead group of five. The race exploded on the last lap when previous efforts took their toll. Keith and Jenkinson finished in 4th and 5th. Davis claimed a top 15. The A women’s race developed in a similar way with four riders in the lead group including Mars Hill’s Klara Rossouw. That number was reduced to three when Rachel Millsop, last year’s D2 individual omnium national champion, crashed in the single track. The three carried on with Rossouw sitting second wheel and looking strong. Millsop chased but never regained contact with the leaders. With one lap to go Rossouw lost contact but still managed to hold on to a strong 3rd place. Laura Rice represented Mars Hill in the B women’s race and looked strong from the beginning by taking the hole shot into the first section of single track. In her first bike race ever, Rice showed determination by fighting all the way to the end and earning a spot on the podium in 3rd. Klara Rossouw rails a berm in the dual slalom. Later in the afternoon, Rossouw, Davis, and Marco Liubenov competed in the dual slalom. Rossouw looked to be the fastest of the A women but settled for 2nd after a bobble in the last race. Liubenov set the 3rd fastest qualifying time among the B men and won his first heat before being knocked out in the next heat by a crash. Davis, in his first gravity race as an A, failed to qualify after misjudging the finish line. In Sunday’s cross country racing, Mars Hill suffered from too many mishaps and mechanicals to name but still had strong finishes from Keith (6th, A men), Rossouw (4th, A women), and Rice (6th, B women). Next up for the team is Collegiate National Track Championships in Indianapolis this week on September 15-17. We return to mountain bike action on October 1-2 for home races the the team will host at Alexander Mountain Bike Park. For more photos of the Georgia Tech races see our Facebook page.